Striped large-eyed bream (Gnathodentex aureolineatus) in foreground over shallow reef. Image Courtesy NOAA / Dave Burdick. NOAA announced today it will afford Endangered Species Act protections to 20 coral species. All 20 species will be listed as threatened, none as endangered. Fifteen of the newly listed species occur in the Indo-Pacific and five in the Caribbean. “Coral reefs are one of the most biologically diverse ecosystems on earth, providing habitat for many marine species. Protecting and conserving these biologically rich ecosystems is essential, and the Endangered Species Act gives us the tools to conserve and recover those corals ​most in need of protection,” commented Eileen Sobeck, assistant administrator for NOAA Fisheries. Today’s announcement is a significant change from the proposed rule in November 2012. Since that time, many new scientific papers on climate change and coral habitat, distribution and abundance were published so that NOAA was able to consider and incorporate new information into the final decision. NOAA also considered extensive public comments as part of the final rule making. The new information provided after the proposed rule was published strengthened the body of species-specific information available to NOAA for its final determination. The new information also improved the agency’s understanding of coral habitat diversity, abundance, distribution and species-specific exposure to threats and their relative vulnerability or resilience. NOAA will continue to work with communities to help them understand how the agency’s decision may or may not affect them. The tools available under the Endangered Species Act are sufficiently flexible so that they can be used for partnerships with coastal jurisdictions, in a manner that will allow activity to move forward in a way that does not jeopardize listed coral. Currently no prohibitions exist relating to the newly listed species. Coral reefs are critical to the health of marine ecosystems, and they face severe threats. Coral reefs world-wide have declined significantly—some individual species have declined by at least 90 percent. Healthy coral reefs provide shoreline protection for coastal communities and habitat for a variety of species, including commercially important fish. These benefits are lost when corals are degraded. As part of this rule-making process, NOAA identified a number of threats to coral ecosystems. Some of the most serious threats include: impacts related to climate change (rising ocean temperatures, ocean acidification and disease), ecological effects of fishing, and poor land-use practices. NOAA will work with partners on mitigation measures and recovery plans for the newly listed corals. 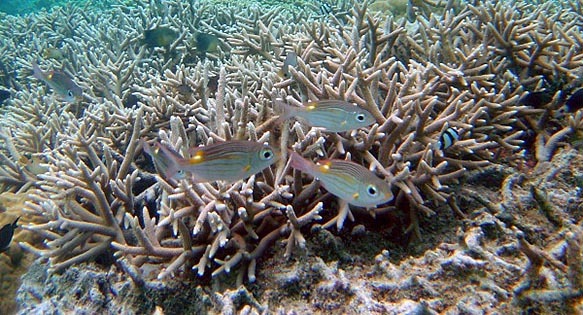 These will likely include approaches that have shown success elsewhere, such as watershed management, to address land-based sediment pollution in the U.S. Virgin Islands and Hawaii, and restoration efforts in the Southeast where NOAA and partners are transplanting corals grown in nurseries to help recover degraded reefs. NOAA’s mission is to understand and predict changes in the Earth’s environment, from the depths of the ocean to the surface of the sun, and to conserve and manage our coastal and marine resources. Join us on Facebook: https://www.facebook.com/NOAA , Twitter and our other social media channels.